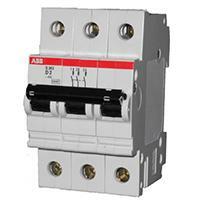 Control Components, Inc. offers the full line of ABB, Eaton, IDEC, and GE Low Voltage Circuit Breakers. Circuit breakers offer superior protection over fuses in applications containing relay circuits, motors, heaters, transformers, solenoids, and semiconductors. Control Components is an authorized distributor for the full line of ABB, Eaton, IDEC, and GE Low Voltage Circuit Breakers.